T.N.R.® Feminized is a special outdoor plant. The parents are a Thai lady that has been growing for 28 years in Holland, crossed over with a double K.C. 2. This plant is the giant of the cannabis plants, with huge colas. The buds have a pure Thai-aroma. K.C. Brains Seeds T.N.R.® Feminized is a seed that has been in development for over 10 years and finally was perfected this Thai based strain. They crossed her with K.C.2 and got a new very potential indica dominated seed, THR. Many generations have been generated from this marijuana strain. 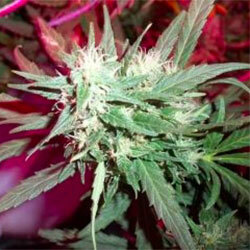 T.N.R.® Feminized seeds have been specially designed for outdoor. They are highly resistant to mushroom, pests and diseases, and produce plants with a very interesting look possesses characteristics of her both cannabis parents. These tiny cannabis seeds can turn into sativa looking giants of 4 m. high, producing huge colas under optimal conditions. Like any other indica, T.N.R.® Feminized grow faster and have a higher yield than the sativa variety. Her flowering period is just 9-12 weeks with an enormous yield of up to 1000 gr. per plant that can be harvested already in mid October! Medicine produced from cannabis indica plants have higher CBD and lower THC counts therefore a pure indica strain will produce a heavier, sleepy type of high. What makes T.N.R.® Feminized special is her ability to grow perfectly well indoors. She is an ideal plant for beginners. As an indoor marijuana variety, her seed grows as tall as just 80 cm., still keeping plants resistant to mould and still producing a great yield of app. 150 gr. per plant. This variety is happy to grow in a group of greens, yet, it doesn’t mind at all to be potted as an individual plant. As both parents of this cannabis strain are very consistent, the offspring is very consistent too. Wherever you decide to grow your T.N.R.® Feminized marijuana, the result is great. She is easy flowering producing big, juicy flowers which turn buds covered with big crystals after a short flowering period. Pure Thai, sweet and spicy, aroma begin to spread shortly after flowering. This cannabis variety has a lot to offer with a really strong, cerebral and challenging, mellow high. T.N.R.® Feminized is said to contain an incredible 22% of THC.